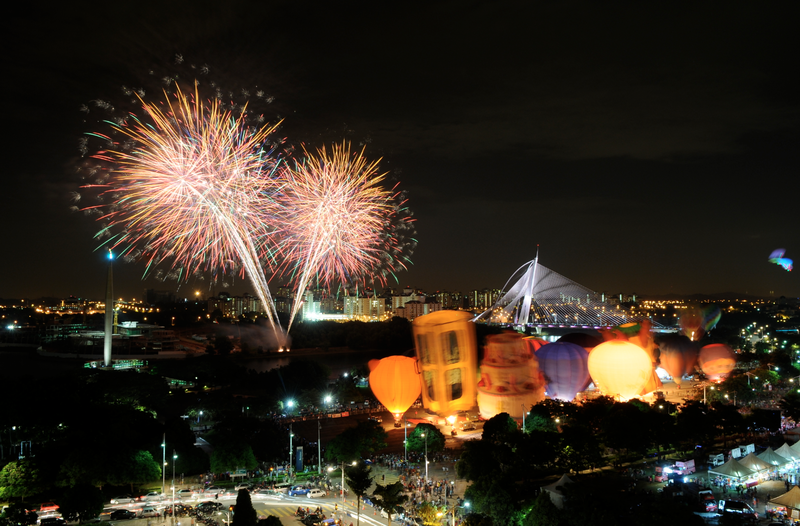 The annually anticipated 7th Putrajaya International Hot Air Balloon Fiesta 2015 will take place from 12-15 March 2015 at its homeground in Precinct 2, Putrajaya next month. Held over the course of four days from Thursday-Sunday, 12-15 March 2015, this year’s Fiesta features yet again an amazing line-up of international balloonists alongside first-time and upgraded attractions and activities. The Fiesta’s lineup of activities and international balloonists, event programme and sponsors were revealed today at a press conference event held at Dewan Sri Siantan, Putrajaya Corporation Complex. Nur Izzati Khairudin, Event Director of the 7th PIHABF shared: “We are excited to once again present a world-class lineup of talented international balloonists, and to grow our on-ground activities such as the addition of MyBalloonClub this year. The Fiesta is a homegrown event that supports the nation’s goal of being a major tourist destination, and with a large number of local and international attendees we are able to continue to offer great visibility and opportunities to our event partners and sponsors,” she said. The 7th PIHABF is one of the main events listed in Perbadanan Putrajaya’s Calendar of Events. Proved to be a much awaited occasion, the last PIHABF 2014 saw 83.3% of visitors travelling 70km or further just to attend the Fiesta. Among the thousands of visitors last year, one-third were non-Malaysians from around 70 different countries, and approximately half (46.5 %) of visitors attended with their family members. The Fiesta organisers will eagerly welcome a large number of first-time attendees alongside returning visitors as up to 71.5 % of last year’s crowd shared their interest to come again for the 7th PIHABF this year. Officiating the press conference was President of Perbadanan Putrajaya, Tan Sri Dato’ Seri (Dr) Aseh Bin Hj Che Mat, who expressed his pleasure in welcoming the Fiesta visitors to Putrajaya every year: “This will be the Fiesta’s seventh time in Putrajaya, and the third time I have been personally involved with the event. Many people have the perception that Putrajaya is a city where only government agencies reside, but it brings me much joy to see the diverse crowd of visitors of every background that come to Putrajaya every year for the Fiesta, and in-line with our goal to support Malaysian tourism, we look forward to welcoming the international visitors as well,” he said. 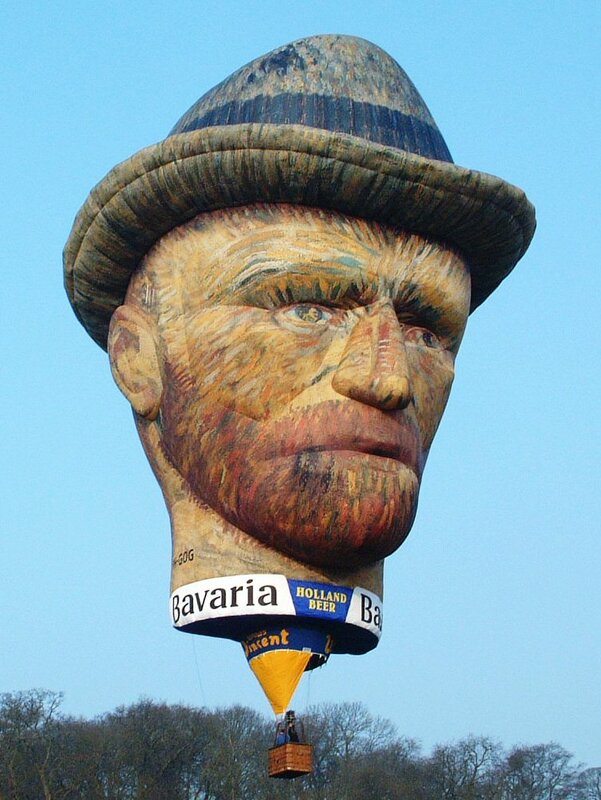 Headlining the balloons is a first-time feature in Malaysia, the Van Gogh balloon from Netherlands. This special hot air balloon will be celebrating its 150th anniversary, and the local art community will be invited to draw and create Van Gogh tribute art at the Fiesta grounds as the balloon flies overhead. As one of the favourite annual highlights, this year will see Night Glow held over not one, but two nights on Saturday and Sunday. Watch the hot air balloons come alive as pilots ignite their burners, transforming their balloons into glowing bulbs set to float across the evening sky. Top it off with music and a spectacular fireworks finale. This year will see the introduction of MyBalloonClub, a premium gourmet breakfast experience that promises the best viewing seats away from the busy Fiesta crowd. 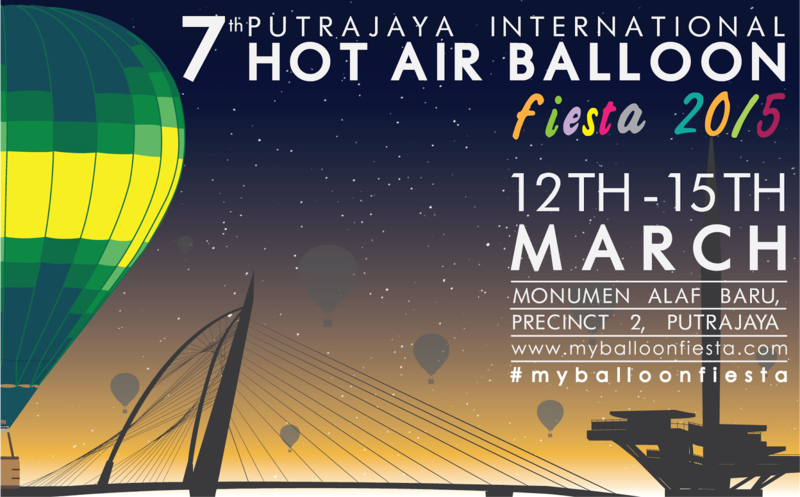 Held every morning at Monumen Alaf Baru on the Fiesta grounds, MyBalloonClub patrons will also be eligible for tethered hot air balloon rides. Making a return is the Picnic Area whereby visitors can bring along a picnic mat and enjoy the view of Putrajaya lake and watch the flight of hot air balloons float by. By pre-ordering a ‘Balloon & Breakfast’ set, food and Doof bean bags will be provided. Helicopter Joyrides whereby this year will feature a brand new chopper with plush business class interior that seats up to 6 passengers (excluding pilot). The bazaar area will get a new look, feel and feature market fare of clothing and accessories by KL Calling, while Fried Chillies and Rock and Tulips will provide a revolving cast of food stalls and trucks located at the Purple Zone. There will be lots of adult- and children-friendly activities to keep visitors busy from outdoor and extreme sports including Cold Inflation whereby visitors will be able to walk inside a gigantic hot air balloon, as well as meet and greet with the balloonists, outdoor laser tag, zorb ball, paintball and a wind chamber. Organisers of the 7th Putrajaya IHABF once again acknowledge the paramount contributions and commitment of the Fiesta’s sponsors and partners, of whom representatives were in attendance during the conference: Putrajaya Holdings Sdn Bhd (as Event Partner), Nestle Products Sdn Bhd (as Presenting Partner by Nestlé® Liquid Drinks), Mi Sedaap (Gentle Supreme Sdn Bhd as Promotional Partner “Instant Noodles: Exclusive Category”), Amin Faried (M) Sdn Bhd (as Helicopter Joyrides Sponsor), Doof Industries (as Picnic Area Sponsor), Red Box and Green Box (Official Karaoke), The Everly Putrajaya (Official Hotel), 988 FM, Suria FM, Red FM, Capital FM, Astro, World Labs Global and TapauTV (as Media Partners). The Fiesta also introduced EFY Dot Com as Corporate Booth Sponsor. As per previous years, general admission is free, with prices for selected attractions such as Helicopter Joyrides, MyBalloonClub, ‘Balloon & Breakfast’ and passes to NightGlow priced individually. 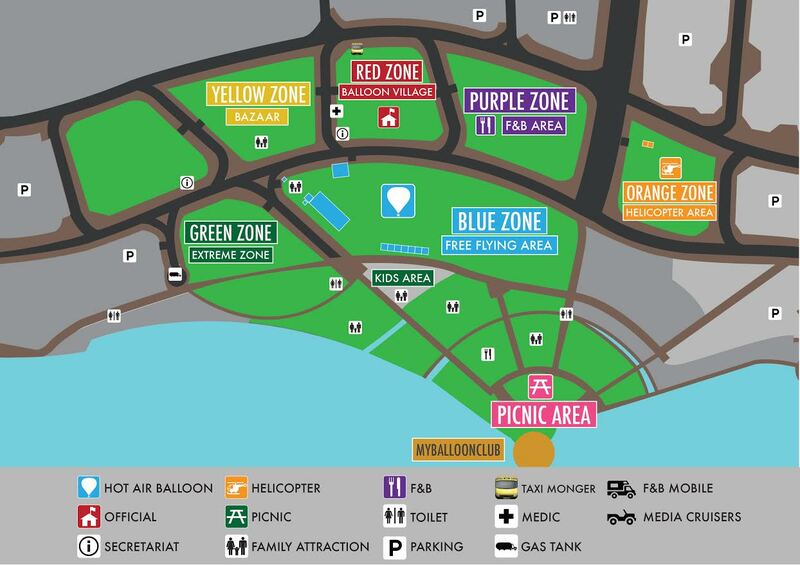 Visitors are encouraged to browse the Fiesta website www.myballoonfiesta.com to find out more information, see a map of the grounds and book tickets online. Fans of the Putrajaya IHABF can follow the Fiesta’s social media: Putrajaya International Hot Air Balloon Fiesta on Facebook; @myballoonfiesta on Twitter and Instagram; as well posts with the official hashtag #MyBalloonFiesta. 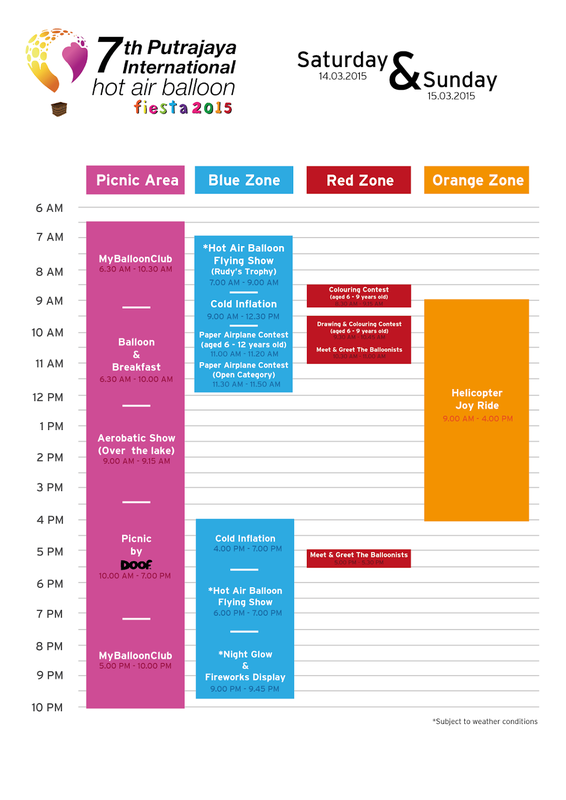 To make it simple, Hot Air Balloon flying show will start from morning 7am-9am and night 6pm-7pm. if you wanna watch the Night Glow and fireworks display it will be at night 9.00pm to 9.45pm during the weekend. Visitors can take advantage of special discounted rates and cashback promotions for public transport with event partners. Book a taxi with TaxiMonger to go to “PUTRAJAYA MY BALLOON FIESTA 2015” and enjoy a RM15 cash-back for advance bookings and a RM5 cash-back for non-advance bookings, or buy a ticket for the KLIA Transit train at a 35 percent discounted rate. There will also be Nadi Putra buses at only RM0.50 from the Park & Ride near main transportation hub Putrajaya Sentral. 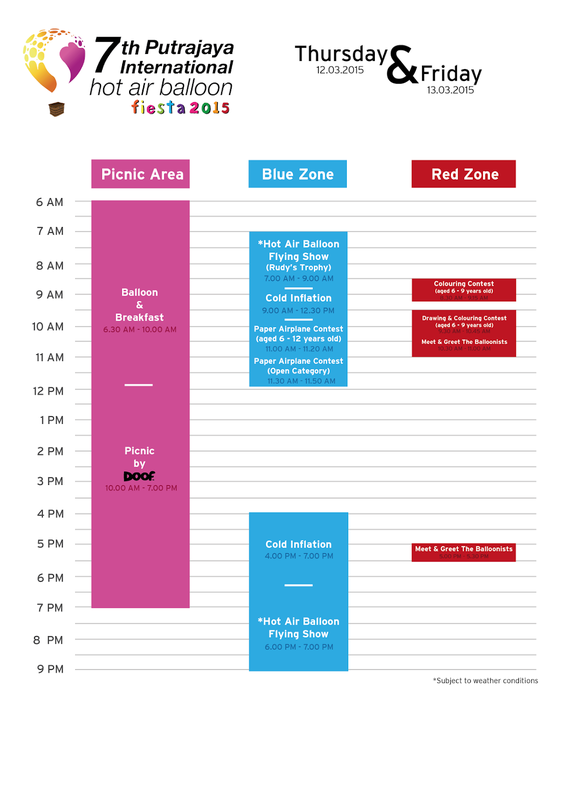 For viewings of the balloon flights as well as for first-come first-serve attractions, visitors are encouraged to arrive by 7am for morning events and by 6pm for evening events. The 7th Putrajaya International Hot Air Balloon Fiesta 2015 is jointly organized by AKA Balloon Sdn. Bhd and Perbadanan Putrajaya (PPj). 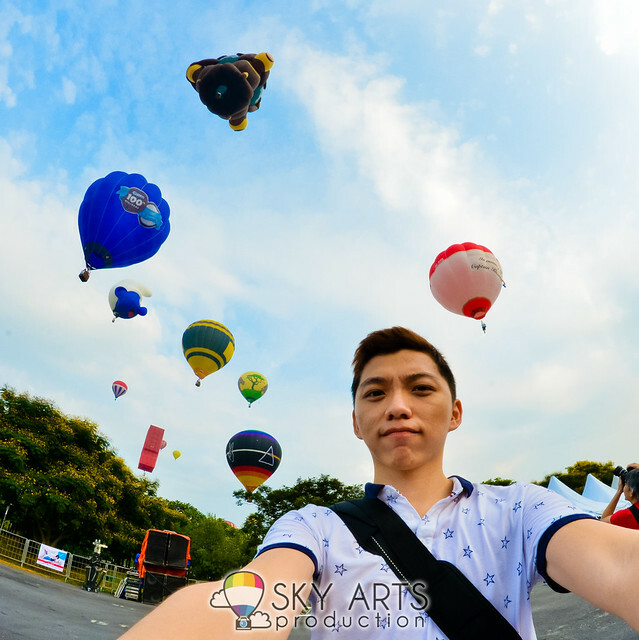 I've went to Putrajaya International Hot Air Balloon Fiesta for a few times and my advice to you is to get your ticket earlier for the tether hot air balloon ride. Here's a video I did for 5th PIHAB 2012. Enjoy!! Do you plan to go this time?? I've seen loving couple doing proposal at the Hot Air Balloon and the crews having fun inflate/deflate the balloons. Now this has reminded me that I haven't do the video for 6th Putrajaya International Hot Air Balloon Fiesta 2015 hahaha. Hopefully I got time to process all the photos and video soon ya!! For more information do visit www.myballoonfiesta.com.